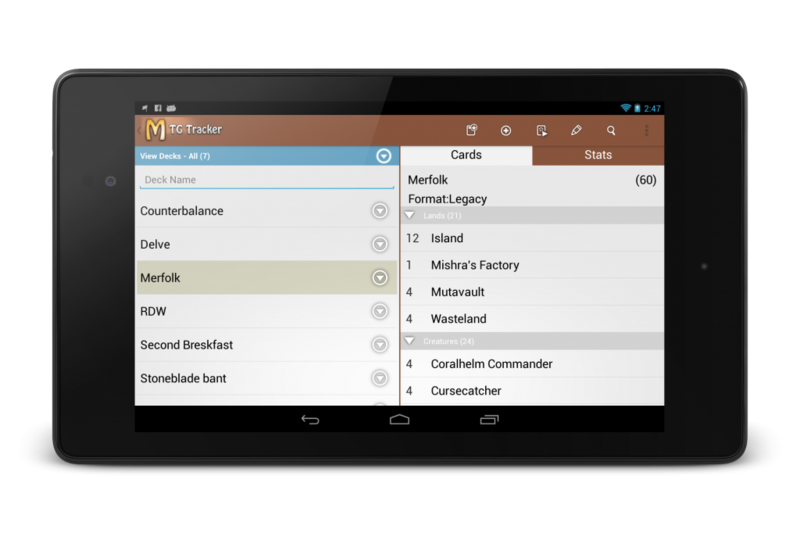 We just published version 6.1 of MTG Tracker, and is all about casual formats. We were the first ones to support EDH more than 3 years ago. Long before it got the name changed to Commander. We love casual formats, that’s why It was time to include some other formats that are getting more and more popular lately. Tiny Leaders is getting steam quickly, it is a smaller Commander mode with cards of converted mana cost of 3 or less, decks of exactly 50 card, 25 life points and no Commander damage. Check it out at the official site. Pauper is a format when you can only use commons. Very cheap to build, lots of fun. It has been a format for Magic Online for a while. 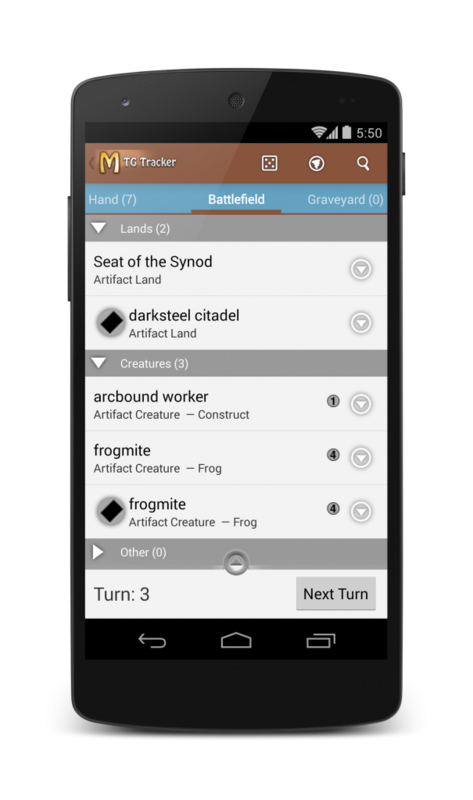 Duel Commander is a modified version of Commander designed to play one-on-one. Different ban list and 35 life. Check the official site for details. 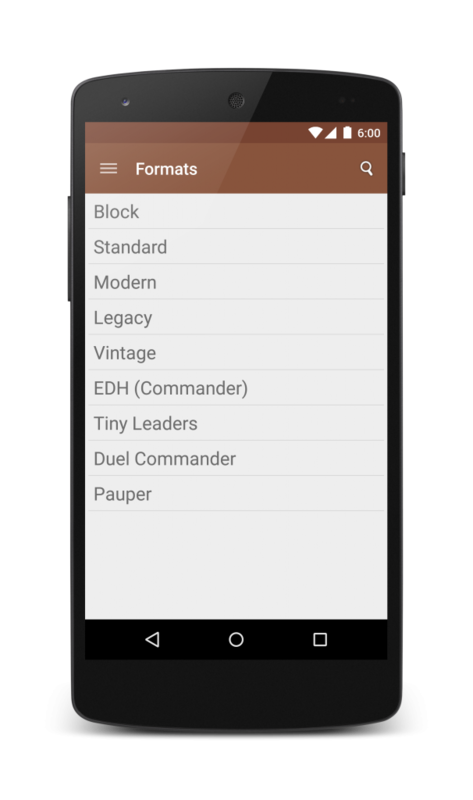 These formats have now a slot under the formats section, a deck type that checks for invalid cards and in the case of Tiny Leaders and Duel Commander, a game mode. Also, business as usual, the latest set “Dragons of Tarkir” has been added to the app. The cards from “Duel Decks: Elspeth Vs Kiora” have been also added. MTG Tracker has been updating a lot, usually UI changes are made gradually, but sometimes they are big. This update is one of the big ones, and I want to take the chance to look back to all the journey. 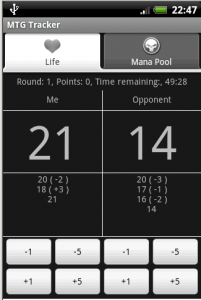 The app started with a single screen with a life counter for 2 players. Nothing really flashy. New features were added as tabs, Mana Pool, then Stats, then Decks. Tabs were cool on the early days of mobile apps. Then the ActionBar was presented, and with that, MTG Tracker moved to ActionBar + Dashboard. That is the other time the app had a considerable redesign. Moving forward, and adding features, at some point the app had so many features that a Dashboard was not enough. Also, a new pattern was emerging: Menu Drawers. So, we added one, not a big change, but still important. And with this, we get to Material Design, the big push from Google with Lollipop. We are adopting quite some new patterns. An image is worth a thousand words. 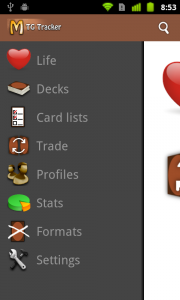 The new toolbar has a more obvious drawer icon and the icon is removed from the bar, leaving some space for options and titles. It also has a very nice animation when opening the menu drawer. There used to be a blue bar under the action bar for extra options on some screens. This is now part of the toolbar, giving am ore consistent look and feel. 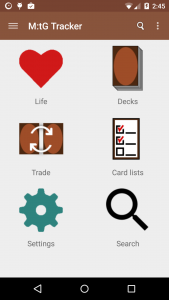 Bonus points: Decks also have a Quick Return Header pattern, which hides part of the header when you scroll down and shows it again when you scroll up. In most of the screens, there is a floating action button for the most prominent action (like add a new deck or add cards to a deck or a list). The extra options for elements on a list were displayed with a quick action menu, which was cool when we started using it, but now everyone is moving to the popup menu with 3 dots, which is also more clean, so that has changed as well. 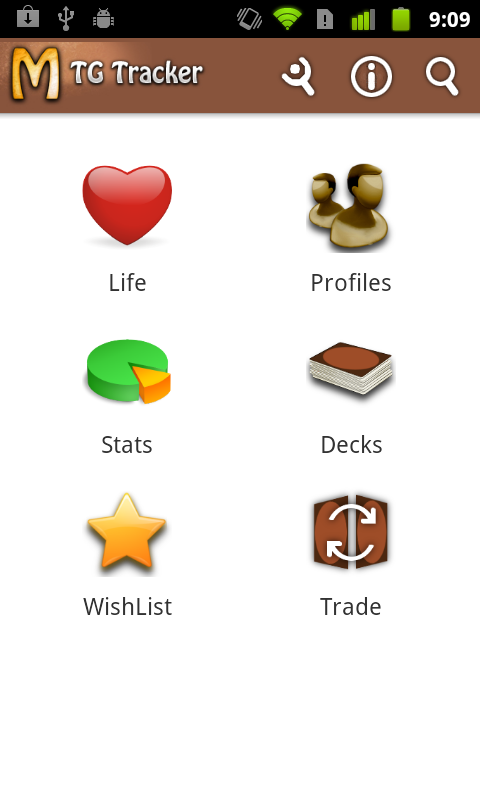 We also changed the icons of the home screen and the drawer to simpler, more clear versions of them. Search is now an option on the menu drawer as well as in the main screen. It is much more accessible there than from the icon on the action bar. Deck edit has disappeared. It was confusing and was not adding much value. The decks can be edited now at any time. As it was for Card Lists and Trades. I want to change some other parts of the user flow, but that will have to wait another update. No spoilers on that one. EDH banned list has been updated. 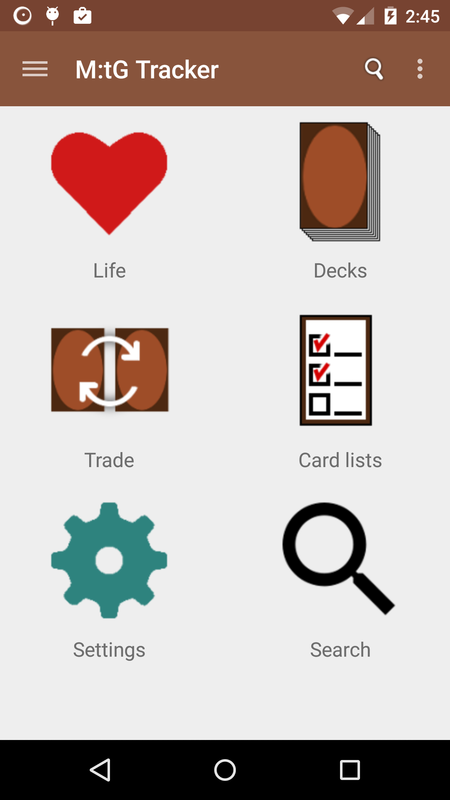 Fixed a problem when adding the card “_______” to a deck or list. It’s been a while since the app became version 5.X, hopefully this will be the last update before we move to 6.0, which will include material design. But let’s focus on this release. 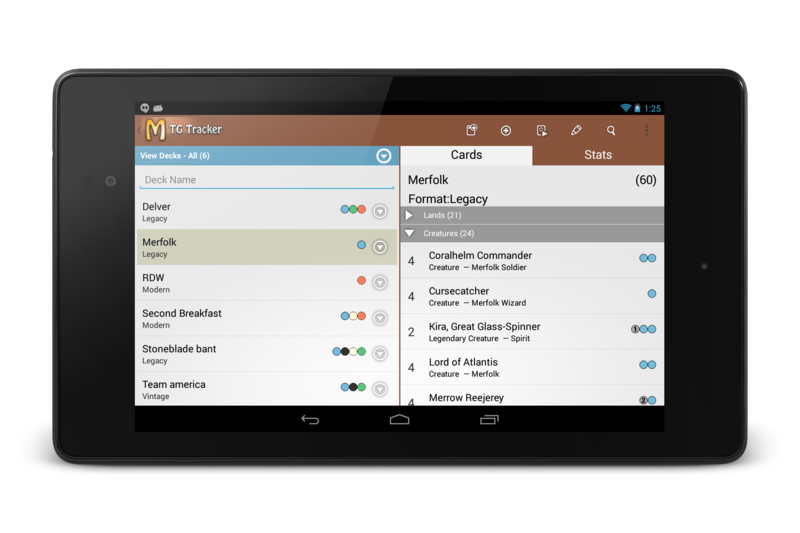 Commander 2014 is about to hit the shelves and here is another update of MTG Tracker. Until now, there was little to none information about if a list was being filtered or not, just the amount of cards displayed Vs. the total cards in the list. In previous versions, the filter criteria was shared among card lists, which was a bug that has been solved. 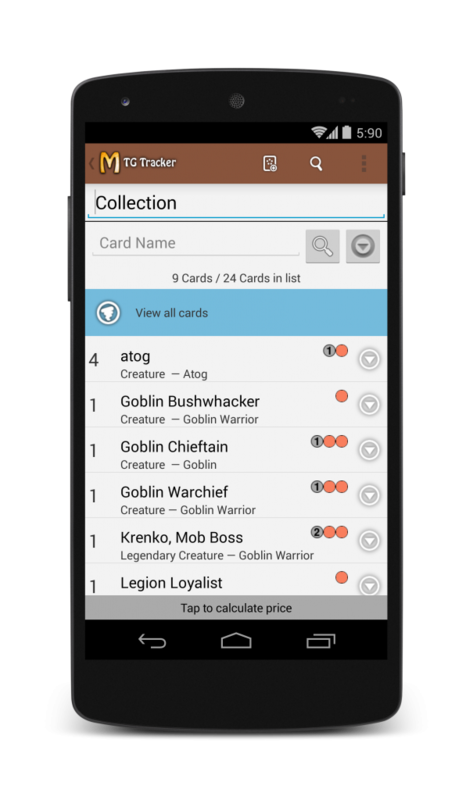 Now each card list has now its own criteria. Also, filters are now cleared when you exit the card list. Before this version they were stored even among application runs, bringing lots of confusion. Combined with the previous bug, it was quite confusing. I hope to have solved all that issues. Finally, there is a new easy & prominent way to clear the filter of a list as soon as some cards are being hidden by the filter. Another core set is here: Magic 2014 Core Set, and another update of MTG Tracker is here as well. In particular, I want to talk about the improvements on format validation. Until now the format validation checked if the cards were valid or not. Just that. It will also validate that any constructed deck has at least 60 cards, for unknown formats the lower limit is 40 cards. In future updates the restricted list will be added to vintage with proper validation. WotC has just released a new set designed for draft: Conspiracy. 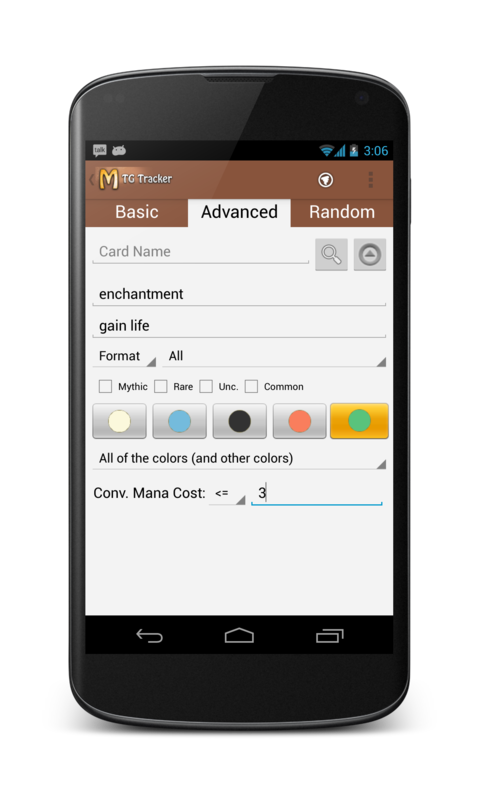 As any new set, it has new cards, and so, a new version of MTG Tracker is released. 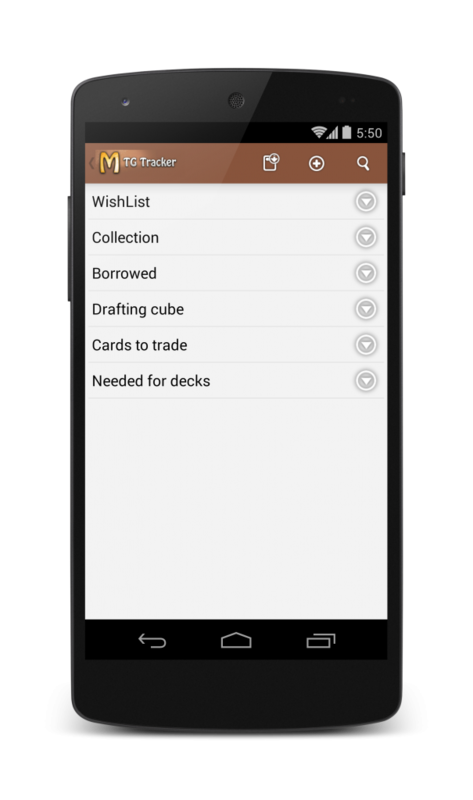 Added option “Import into List” on Card Lists. So, in addition to including Conspiracy and Modern Event Deck, other improvements have been done. 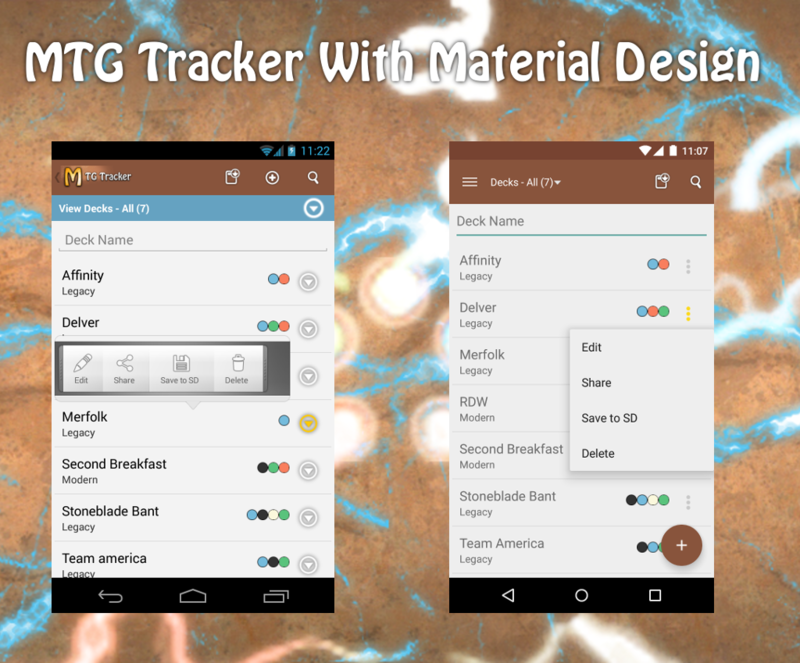 MTG Tracker has migrated away from ActionBarSherlock and now uses the official ActionBarCompat and DrawerMenu. This visually only means that the icon on the top left shows three lines when it opens a menu and an arrow when it goes back. Subtle, yet important. The drawer menu seems to be hard to discover, so now the dashboard adds two new items, one of them called “More…” which opens the side menu. 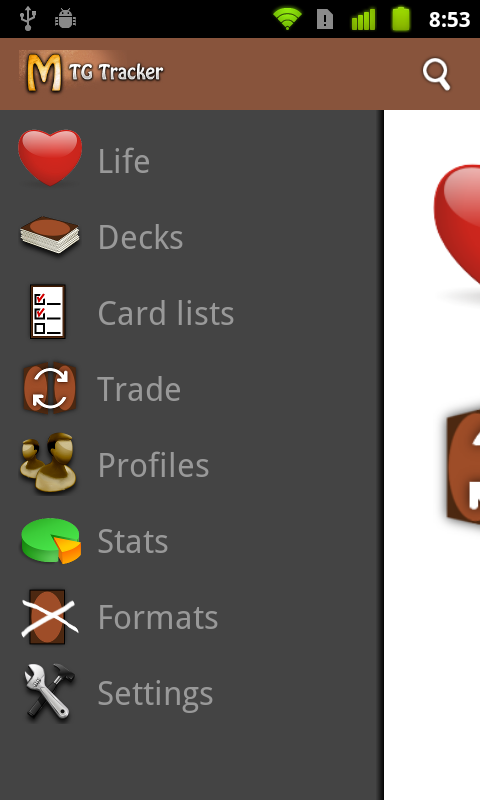 You can compare the old and new dashboards and also see the difference in the action bar icon (arrow Vs. three lines). 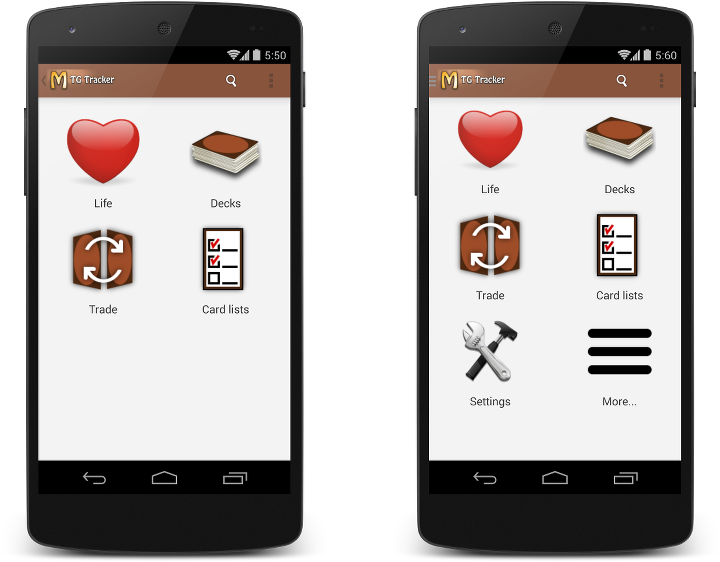 Some animations have been added to the card display and the life counter, they are meant to make the user experience more enjoyable with a more playful design. And a few bug fixes, specially crashes when browsing many cards. 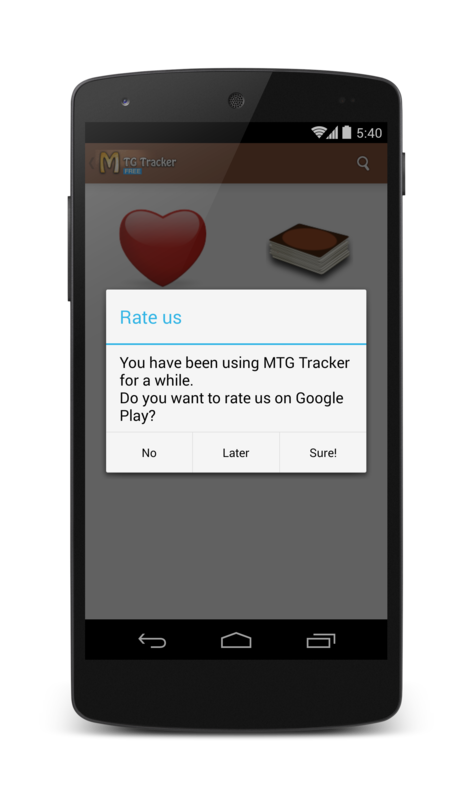 Paid apps always had a better ratio of users leaving feedback than free ones, but in the case of MTG Tracker it was too much. MTG Tracker used to have a very good ratio of users that leave comments. This was reduced when Google Play required G+ sign in to leave a comment, and that was specially bad for the free version, which was released after that change was made. Both had good average rating, but while almost a 6% of the users leave a rating on the paid version, for the free one that number it is under 0.6%. Yes, 10 times less. So, I decided to add a “Rate Us” dialog to improve that, knowing that the users of the app use it a lot and just may never thought of rating it. Please note that the free version has much more installs per day. So, almost 100 new ratings on the paid version and 35 more for the free. The conversion rate grow for both apps. Still the paid version got even more ratings. I decided to let a few more days pass and checked again. Another 80 ratings for the paid version and 40 for the free one. Also, average ratings for the paid app keep getting higher, but the ones for the free seem to oscillate. As it turns out, the percentage of users leaving a rating on the paid app is almost the same as before the dialog was introduced, but the ratio of reviews for the free version has grown up to 0.7%, may not seem much, but the free app has 30% more ratings than before. After this experiment, it is very clear to me that you must always add a “Rate Us” dialog, even if your current amount of ratings is good. Most users are lazy and will not rate your app unless you ask them to do it. Trigger the pop-up after a satisfying user experience, users will be more likely to give you positive reviews if they are in good mood. Obviously, as with a new set, the cards need to be added to the app. This has been requested many times. 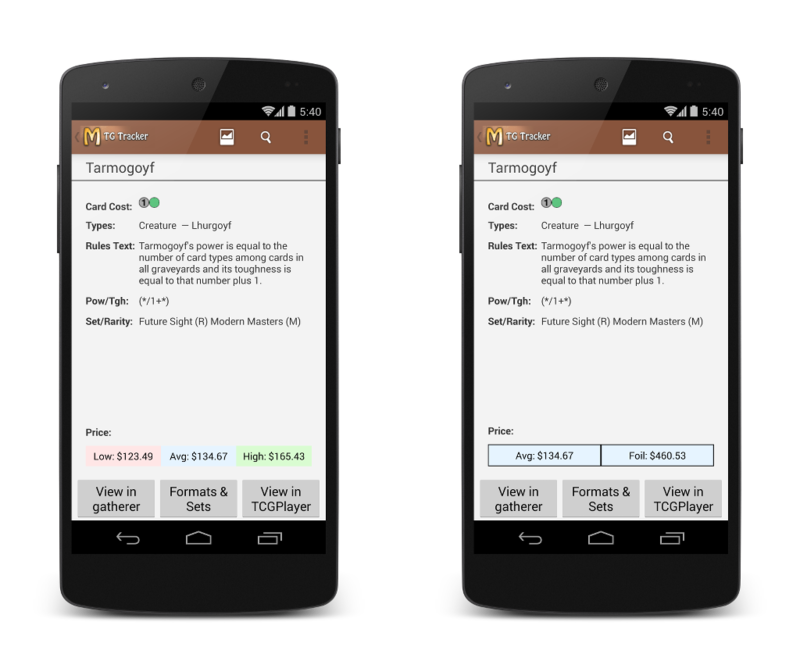 Although it was possible to get foil prices via CardShark, most people uses TCGPlayer as a price reference. There were a few crashes and misbehaviour on the card list section when used on a tablet. I was aware of the bug thanks to a user that mailed me with very extensive steps to replicate both problems. Is because of users like this that I love building the best product I can. Another feature suggested by a user. Adding more power to the advanced search by allowing literals and negations. Some examples of why this is useful. Because it is not the same to search for “target player discard” than for target player discard. The results are down from 232 to “just” 91. But it gets better, when searching for creature damage, we get almost 2,000 results, but if we want to filter out the cards that do not require to target, we just add ~target to the search, and we are down to “only” 811 cards. Still plenty of creatures that do damage when summoned, but definitely a shorter list. Also a very requested feature, when you use any kind or ramping effect (searching for basic lands) or any type of tutor, searching all the library was inconvenient. 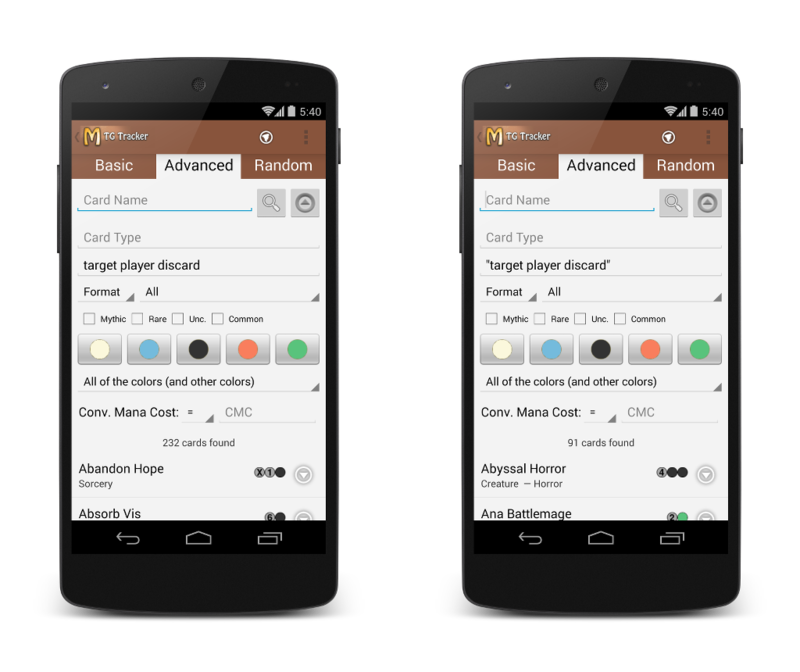 Since the last version, deck screens included the cards casting cost and type. This “extended information” view was very well received and it is now also included on card lists and trade.